that grow from a swoolen or thick basal growth. Only about a half of all bulbous plants are actually true bulbs. The remainder of them are corms, rhizomes or tubers. Bulbs, corms, rhizomes and tubers are all storage units for food that gives the plant the energy it needs to grow and bloom. True Bulbs are the thickened underground storage organ of the group of perennials which includes Daffodils, Tulips, Lilies, Narcissus and Amaryllis. Bulbs grow in layers, like an onion. At the very heart of the bulb is a miniature version of the flower. Rhizomes are modified plant stems that grow horizontally under the surface of the soil. New growth then emerges from different points of the rhizome. They will continue to grow and creep along under the surface producing lots of growing points. Calla Liles, Canna, Bearded Iris and Water Lilies all grow from rhizomes. Tubers are flat underground stems which have a tough leathery skin and several eyes which are the growing points where the plants will emerge. This group includes Dahlias, Begonias, Caladiums and Anemones. to continuous color and changing color schemes from late winter to early summer. then your planning will only involve 'where' you are going to set the bulbs. into the plant heights and blooming times. Generally, the earliest flowers to bloom in the spring will be the Crocus and Snowdrops followed by Daffodils and Tulips. Before the spring bulb season is over, the Dutch Iris and Spanish Bluebells will grace your garden. of hybrids which bloom at different times (i.e. early April, mid April, late April). 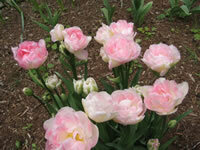 Use these hybrids to spread out the bloom time for each group, and you can enjoy each species for a much longer time. As the last of the spring flowers fade away the early summer bloomers like the Star of Bethlehem will begin to flower. There are many bulb type plants that bloom throughout the summer. Cyclamen, Autumn Crocus and Fairy Lilies bloom well into the fall. Snowdrops end or begin the year of bulb blooms in late winter. The 'staging' of the planting area is of vital importance. based on where you will be viewing them the most often. Think about your color scheme as you draw your map. Contrasting colors make a great display, or you may want to use many hues of the same color. 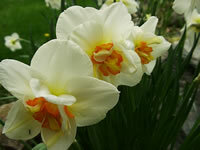 Using white flowering bulbs will brighten even the plainest corner of the garden. The most popular method is that of massed garden plantings, where several groupings (of at least 5 bulbs each) are planted together. Many gardeners consider it a no-no to plant bulbs in a single straight line. but I use a 'modified' straight line (double line), offsetting each second bulb by an inch or two. This gives the 'line' a little more stability against winds. Always buy top quality, firm, healthy bulbs! Avoid so called bargain bin bulbs. Inspect them carefully for blemishes and soft spots. The sooner you plant your bulbs after purchasing... the better! Many bulbs can be forced into bloom by planting them in pots, and growing them indoors. Most spring flowering bulbs require 12 to 14 weeks of temperatures below 40 degrees during the winter, which is why they are planted in the fall. If you live in a climate that doesn't have this cold spell, you'll need to pre-chill certain bulbs before planting them. This can be done by placing them in a refrigerator or cool (below 40°) basement. In colder climates, gardeners should consider covering their planting with a protective layer of leaves or mulch. In severely cold climates, or in light sandy soil, bulbs should be planted 1" to 2" deeper. Bulbs will supply all the energy they need to produce that gorgeous bloom during the first year. so that they can continue blooming in future seasons. Allow the foliage to continue to grow after the spent flower spike has been removed until it dies back naturally! If space is limited, bulbs can be planted in layers. 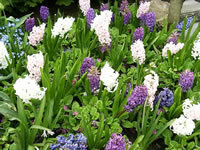 Dig a hole deep enough to accommodate the largest bulbs (Daffodils and Hyacinths). Cover them with soil and plant a layer of tulips. Cover the Tulips and plant a layer crocus or other small bulbs on top. You can protect your bulbs from marauding rodents by lining the planting hole with 1/2 inch (or smaller) mesh chicken wire.